When it comes to disrupting project process, confirmation bias will wreak absolute havoc. In general, confirmation bias means that we establish beliefs about how the world works, and either build evidence to confirm those beliefs, or remove evidence that contradicts those beliefs. Specifically, confirmation bias also means that we will establish beliefs about the projects we are a part of, and either build evidence to confirm those beliefs, or remove evidence that contradicts those beliefs. Frankly, this jacks things up. How might confirmation bias wreak havoc on this project? Designed and developed landing pages have been delivered to the client. Feedback has been requested, but it has been several days and you haven’t heard a thing. You’ve emailed the client, offering help and asking if there are any questions. You’ve made yourself available, and your emails are kind and succinct. Your team is growing restless. A deadline is about to be missed. What bias would you be confirming? Your client contact scrutinizes every page of every report you deliver. Every recommendation is met with questions. Every project highlight is ignored. Every angle of the project is actively reviewed, with disagreement openly expressed. Emails are short, blunt, and few and far between. What bias would you be confirming? The issue at hand in both of these scenarios is that once you have made a decision about how to view them, you will begin to ignore information that contradicts your viewpoint. Havoc ensues. Dobelli concludes that the antidote to confirmation bias is disconfirming evidence. He writes that, “the more correct you feel your theories are, the more actively you should look for contradictions.” This becomes the disconfirming evidence that will allow you to block confirmation bias. 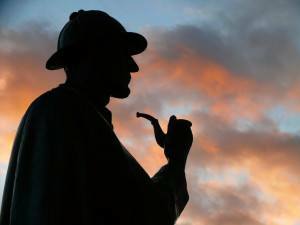 It’s time to exercise your inner Sherlock Holmes! Let’s look again at the two scenarios from above, and discover how disconfirming evidence allowed me to unwind project confirmation bias. Simply put, the client had a massive event two days after we delivered the landing pages. They were so busy that there was little time to review them. They were a blip on the client’s radar at the time of delivery. And what happened? Early the following week they provided great feedback. This led to an approval, which led to great landing pages. I love this client contact! I discovered that all of the project scrutiny is a result of the fact that the client contact is invested in the project. His willingness to “slice and dice” is an act of investment and collaboration. I love these kind of projects. And trust me, if there are real time issues with the project, my inbox has email. You must take the time to look for disconfirming evidence to untangle the nasty web of confirmation bias in the projects you work on. And on a larger scale, you must also take the time to look for disconfirming evidence to untangle the even nastier web of confirmation bias in the other areas of your life. One way to do so, as recommended by Dobelli, is to actually write down a list of your beliefs about your projects, your relationships, your worldview, healthcare, diet, the Internet, your favorite restaurant – whatever – and use these lists to eradicate confirmation bias liberally. Doing so may take some work, and changing your beliefs may feel like removing close friends, but in the end it will lead to a better understanding of the world, and the people you work with. It will also lead to increased joy in the successful projects you are a part of. Question: Where has confirmation bias wreaked havoc on your projects? How did you respond? Finally, If our “Be Relentless” moniker resonates with you, take a moment to learn more about Oneupweb. In fact, connect with me on Twitter or LinkedIn, and I’d love to answer any questions you have. My perspective is unique as an Account Manager, and I love interacting.